Aerolatte’s number 4-size Filter Cone is designed to brew 8 to 12-cups of coffee using the manual, pour-over coffee method. Making fresh-brewed coffee in smaller amounts allows for a more enjoyable, aromatic and flavorful brew with less waste. No more stale or burnt coffee made hours ahead. The pour-over coffee method is a time-tested Japanese technique that offers complete control over the quality and flavor of brewed coffee. Pouring a thin, slow, steady stream of water over the ground coffee allows for a distinct, flavorful result every time. 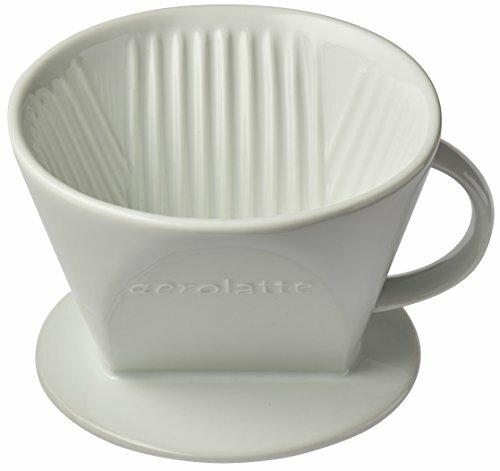 Aerolatte’s Filter Cone is the coffee accessory for making pour-over coffee. Simply rinse the Coffee Filter Cone with hot water to warm it thoroughly. Place it over a mug or carafe and insert a paper or reusable coffee filter. Measure in ground coffee, wet them slightly, and allow them to stand for 15 to 30 seconds. The grounds will expand slightly and release more flavor. Pour the remaining hot water, slowly and evenly. Allow the coffee dripper to finish dripping. Remove the coffee filter cone from the mug and discard the wet grounds. Drink the fresh-brewed coffee immediately. Aerolatte’s Filter Cone makes a perfect coffee accessories gift for at-home baristas and coffee enthusiasts. Made from fine-quality ceramic with a scratch-free glaze for durability. Reusable coffee filter cone is dishwasher safe for easy cleanup. If you have any questions about this product by aerolatte, contact us by completing and submitting the form below. If you are looking for a specif part number, please include it with your message.